Tamil Nadu Legislative Assembly Secretariat is ready to hire the applicants for the 14 available seats of Sweeper, Sanitary Worker Jobs as per the TNLAS Recruitment 2018 advertisement published on department web portal. Job seekers who have required eligibility may apply through Offline Mode after reading all the details of TNLAS Recruitment 2018 through this section.You are needed to send the application form in the appropriate format at the below address till or before 25th October 2018. Education Needed : Candidates who are willing to apply for TNLAS jobs Must be able bodied. The candidates who wish to apply for the available vacancy should be existing between 18 to 30 Years As on 01-07-2018. Reserved category applicants will get the age relaxation as per TNLAS norms. Emoluments given to Employee: Contenders who will be appointed successfully for TNLAS Vacancy, they get the salary pay band of Rs. 15,700 - 50,000/- as per organisation norms. After that choose appropriate link of the advertisement and read the notification carefully. Last Date to Submit Filled-In Application : 25-10-2018. Click Here For TNLAS Official Notification Link. Institute for Plasma Research is ready to hire the applicants for the 13 available seats of Library Trainee, Project Scientific Officer, Project Technician Jobs as per the IPR Recruitment 2018 advertisement published on department web portal. Job seekers who have required eligibility may apply through Online Mode after reading all the details of IPR Recruitment 2018 through this section.Candidates who meet the eligibility criteria and interested to apply they can submit their application form before the last date that is 11th October 2018. Education Needed : Candidates who are willing to apply for IPR jobs must posses Post Graduate Degree (Library & Information Science) / B.E. / B.Tech. / Diploma (Electrical Engineering / Instrumentation / Electronics/ Mechanical) / ITI from any recognised institution. The candidates who wish to apply for the available vacancy should not be more than 30 Years (Post 1-7), 25 Years (Post 8,9). Reserved category applicants will get the age relaxation as per IPR norms. Emoluments given to Employee: Contenders who will be appointed successfully for IPR Vacancy, they get the salary pay band of Rs. 15,000/- (Post 1), Rs. 71,000/- (Post 2,3), Rs. 44,000/- (Post 4-7), Rs. 26,000/- (Post 8,9) as per organisation norms. Selection of the job hunters will be done on the basis of their performance in the Written Exam / Interview and Merit List conducted by the selection committee. Then Enter all your personal and educational information correctly in form and upload the Scanned copy of latest passport size colored photograph and signature in digital format. Verify the same and submit it within the given time period. On successful submission of application, take printout of application form & enclosed all required copies of the particulars with the application form. Deadline for Submitting Online Application Form Is : 11-10-2018. End Date To Submit Hard Copy of Application Form Is : 18-10-2018. Click Here For IPR Official Notification Link 1. Click Here For IPR Official Notification Link 2. Click Here For IPR Official Notification Link 3. West Bengal Law Department is ready to hire the applicants for the 50 available seats of Law Officer Jobs as per the West Bengal Law Department Recruitment 2018 advertisement published on department web portal. Job seekers who have required eligibility may apply through Offline Mode after reading all the details of West Bengal Law Department Recruitment 2018 through this section.You are needed to send the application form in the appropriate format at the below address till or before Within 10 Days. Education Needed : Candidates who are willing to apply for West Bengal Law Department jobs must posses Graduation Degree (LLB) from any recognised institution. The candidates who wish to apply for the available vacancy should be existing between 21 to 50 Years As on 01-01-2018. Reserved category applicants will get the age relaxation as per West Bengal Law Department norms. Emoluments given to Employee: Contenders who will be appointed successfully for West Bengal Law Department Vacancy, they get the salary pay band of Rs. 40,000/- as per organisation norms. Selection of the job hunters will be done on the basis of their performance in the Personal Interview conducted by the selection committee. Last Date for the Submission of Application : Within 10 Days. Click Here For West Bengal Law Department Official Notification Link. Mahatma Gandhi National Rural Employment Guarantee Scheme is ready to hire the applicants for the 25 available seats of Programme Officer, Technical Officer, Technical Assistant Jobs as per the MGNREGA Recruitment 2018 advertisement published on department web portal. Job seekers who have required eligibility may apply through Online Mode after reading all the details of MGNREGA Recruitment 2018 through this section.Candidates who meet the eligibility criteria and interested to apply they can submit their application form before the last date that is 26th October 2018. Education Needed : Candidates who are willing to apply for MGNREGA jobs must posses 10th / 12th / Graduation Degree (Computer Certificate course) / Diploma (Civil Engineering) from any recognised board or institution. The candidates who wish to apply for the available vacancy should be existing between 18 to 40 Years As on 01-01-2018. Reserved category applicants will get the age relaxation as per MGNREGA norms. Emoluments given to Employee: Contenders who will be appointed successfully for MGNREGA Vacancy, they get the salary pay band of Rs. 17,440/- (Post 1,5), Rs. 19,620/- (Post 2), Rs. 11,990/- (Post 3,4) as per organisation norms. Selection of the job hunters will be done on the basis of their performance in the Written Exam, Computer Test and Personal Interview conducted by the selection committee. On successful submission of application a reference number is generated. safe it for future use. Starting Date For Online Application Is : 01-10-2018. Last Date To Submit Online Application : 26-10-2018. Click Here For MGNREGA Official Notification Link. Mahatma Gandhi National Rural Employment Guarantee Scheme is ready to hire the applicants for the 02 available seats of Technical Assistant Jobs as per the MGNREGA Recruitment 2018 advertisement published on department web portal. Job seekers who have required eligibility may apply through Offline Mode after reading all the details of MGNREGA Recruitment 2018 through this section.You are needed to send the application form in the appropriate format at the below address till or before 10th October 2018. Education Needed : Candidates who are willing to apply for MGNREGA jobs must posses 10th from any recognised board. The candidates who wish to apply for the available vacancy should not be more than 40 Years As on 10-10-2018. Emoluments given to Employee: Contenders who will be appointed successfully for MGNREGA Vacancy, they get the salary pay band of Rs. 11,000/- as per organisation norms. Selection of the job hunters will be done on the basis of their performance in the Merit List conducted by the selection committee. Closing Date for Receiving Hard Copy of Application Form Is : 10-10-2018. Maharashtra State Power Generation Company Limited is ready to hire the applicants for the 01 available seats of Chief Finance/ Commercial Officer Jobs as per the MAHAGENCO Recruitment 2018 advertisement published on department web portal. Job seekers who have required eligibility may apply through Offline Mode after reading all the details of MAHAGENCO Recruitment 2018 through this section.You are needed to send the application form in the appropriate format at the below address till or before 12th October 2018. Education Needed : Candidates who are willing to apply for MAHAGENCO jobs must posses Engineering Degree / ICWA / MBA (Finance) from any recognised institution. The candidates who wish to apply for the available vacancy should not be more than 50 Years As on 12-10-2018. Reserved category applicants will get the age relaxation as per MAHAGENCO norms. Emoluments given to Employee: Contenders who will be appointed successfully for MAHAGENCO Vacancy, they get the salary pay band of Rs. 40,790 - 83,750/- as per organisation norms. Last Date to Submit Filled-In Application : 12-10-2018. Click Here For MAHAGENCO Official Notification Link. Cabinet Secretariat is ready to hire the applicants for the 02 available seats of Senior Interpreter, Library and Information Officer Jobs as per the Cabinet Secretariat Recruitment 2018 advertisement published on department web portal. Job seekers who have required eligibility may apply through Offline Mode after reading all the details of Cabinet Secretariat Recruitment 2018 through this section.You are needed to send the application form in the appropriate format at the below address till or before 20th November 2018. Education Needed : Candidates who are willing to apply for Cabinet Secretariat jobs must posses Diploma (Computer Application) / Bachelor Degree from any recognised institution. The candidates who wish to apply for the available vacancy should be existing between 56 Years. Reserved category applicants will get the age relaxation as per Cabinet Secretariat norms. Emoluments given to Employee: Contenders who will be appointed successfully for Cabinet Secretariat Vacancy, they get the salary pay band of Rs. 15,600 - 39,100/- plus Grade Pay of Rs. 6600/5400/-. as per organisation norms. Last Date for the Submission of Application : 20-11-2018. Click Here For Cabinet Secretariat Official Notification Link. Department of Agriculture & Farmers Welfare is ready to hire the applicants for the 50 available seats of Agriculture Assistant Jobs as per the Department of Agriculture & Farmers Welfare Recruitment 2018 advertisement published on department web portal. Job seekers who have required eligibility may apply through Offline Mode after reading all the details of Department of Agriculture & Farmers Welfare Recruitment 2018 through this section.You are needed to send the application form in the appropriate format at the below address till or before 6th October 2018. Education Needed : Candidates who are willing to apply for Department of Agriculture & Farmers Welfare jobs must posses 12th with Science from any recognised board. The candidates who wish to apply for the available vacancy should be existing between 18 to 40 Years. Reserved category applicants will get the age relaxation as per Department of Agriculture & Farmers Welfare norms. Emoluments given to Employee: Contenders who will be appointed successfully for Department of Agriculture & Farmers Welfare Vacancy, they get the salary pay band of Rs. 14,078/- as per organisation norms. Selection of the job hunters will be done on the basis of their performance in the Written Exam conducted by the selection committee. Deadline to Submit Hard Copy of Application Form Is : 06-10-2018. Click Here For Department of Agriculture & Farmers Welfare Official Notification Link. Staff Selection Board is ready to hire the applicants for the 28 available seats of Draftsman, Hindi Typist, Stenographer, Computer Operator Jobs as per the SSB Recruitment 2018 advertisement published on department web portal. Job seekers who have required eligibility may apply through Online Mode after reading all the details of SSB Recruitment 2018 through this section.Candidates who meet the eligibility criteria and interested to apply they can submit their application form before the last date that is 26th, 30th October & 3rd November 2018. Education Needed : Candidates who are willing to apply for SSB jobs must posses 12th / Diploma (Draughtsman/ Computer / Animal Husbandry) / Engineering Degree (Civil/ Electrical) / Graduation Degree (Computer / Statics / Mathematics / Economics) from any recognised board or institution. Those aspirants who are belonging to All Category & interested to apply for above posts they need to be paid Processing fee of 100/-. The candidates who wish to apply for the available vacancy should be existing between 18 to 30 Years (Post 10). The candidates who wish to apply for the available vacancy should not be more than 30 Years (Post 1-9, 11). Reserved category applicants will get the age relaxation as per SSB norms. Emoluments given to Employee: Contenders who will be appointed successfully for SSB Vacancy, they get the salary pay band of Rs. 35,400 - 1,12,400/- (Post 1,2), Rs. 25,500 - 81,100/- (Post 3,6,9,10), Rs. 29,200 - 92,300/- (Post 4,5), Rs. 19,900 - 63,200/- (Post 7,8,11) as per organisation norms. Selection of the job hunters will be done on the basis of their performance in the Written Exam and Merit List conducted by the selection committee. Last Date To Apply Online Is : 26-10-2018, 30-10-2018 & 03-11-2018. Click Here For SSB Official Notification Link. 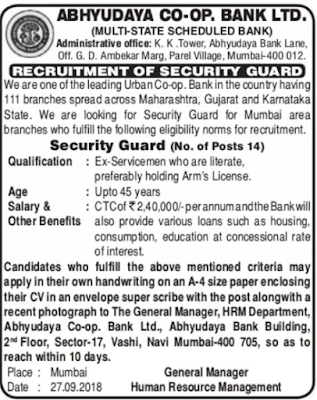 Abhyudaya Cooperative Bank Limited is ready to hire the applicants for the 14 available seats of Security Guard Jobs as per the ACBL Recruitment 2018 advertisement published on department web portal. Job seekers who have required eligibility may apply through Offline Mode after reading all the details of ACBL Recruitment 2018 through this section.You are needed to send the application form in the appropriate format at the below address till or before Within 10 Days. Education Needed : Candidates who are willing to apply for ACBL jobs must Have Ex-Servicemen who are literate. The candidates who wish to apply for the available vacancy should not be more than 45 Years. Reserved category applicants will get the age relaxation as per ACBL norms. Emoluments given to Employee: Contenders who will be appointed successfully for ACBL Vacancy, they get the salary pay band of Rs. 2,40,000/- Per Annum as per organisation norms. Closing Date for Receiving Hard Copy of Application Form Is : Within 10 Days. Directorate of Urban Administration & Development is ready to hire the applicants for the 02 available seats of Finance Expert Jobs as per the Directorate of Urban Administration & Development Recruitment 2018 advertisement published on department web portal. Job seekers who have required eligibility may apply after reading all the details of Directorate of Urban Administration & Development Recruitment 2018 through this section.Candidates who meet the eligibility criteria and interested to apply they can send their soft copy of application form through Email before the last date that is 5th October 2018. Education Needed : Candidates who are willing to apply for Directorate of Urban Administration & Development jobs must posses Chartered Accountant from any recognised institution. Emoluments given to Employee: Contenders who will be appointed successfully for Directorate of Urban Administration & Development Vacancy, they get the salary pay band of Rs. 70,000/- as per organisation norms. Selection of the job hunters will be done on the basis of their performance in the Test / Personal Interview conducted by the selection committee. Closing Date to Send Copy of Application Form Is : 05-10-2018. Click Here For Directorate of Urban Administration & Development Official Notification Link. National Institute of Tuberculosis and Respiratory Diseases is ready to hire the applicants for the 02 available seats of Jr. Medical Officer, Consultant Jobs as per the NITRD Recruitment 2018 advertisement published on department web portal. Job seekers who have required eligibility may apply after reading all the details of NITRD Recruitment 2018 through this section.Candidates who have decided to build their career in this organisation they can attend Walkin Interview which are going to be held On 4th October 2018. Education Needed : Candidates who are willing to apply for NITRD jobs must posses M.Sc / MBBS Degree from any recognised institution. The candidates who wish to apply for the available vacancy should not be more than 35 years (Post 1), 70 years (Post 2). Reserved category applicants will get the age relaxation as per NITRD norms. Emoluments given to Employee: Contenders who will be appointed successfully for NITRD Vacancy, they get the salary pay band of Rs. 60,000/- (Post 1), Rs. 32,000/- (Post 2) as per organisation norms. Walk in Interview Held On : 04-10-2018. Click Here For NITRD Official Notification Link. National Company Law Tribunal is ready to hire the applicants for the 183 available seats of Assistant, Steno, Cashier, Programmer, Private Secretary Jobs as per the NCLT Recruitment 2018 advertisement published on department web portal. Job seekers who have required eligibility may apply through Offline Mode after reading all the details of NCLT Recruitment 2018 through this section.You are needed to send the application form in the appropriate format at the below address till or before 15th October 2018. Education Needed : Candidates who are willing to apply for NCLT jobs must have Officers of the Central Government or State Governments or Union Territories or High Courts/Supreme Court/Courts or Tribunals or statutory organisations or State / Higher Judicial Service holding. The candidates who wish to apply for the available vacancy should not be more than 56 Years. Reserved category applicants will get the age relaxation as per NCLT norms. Emoluments given to Employee: Contenders who will be appointed successfully for NCLT Vacancy, they get the salary pay band of Rs. 37,400 - 67,000/- plus Grade Pay of Rs. 8,700/-. (Post 1), Rs. 15,600 - 39,100/- plus Grade Pay of Rs. 6600/7600/-. (Post 2,3), Rs. 9300 - 34,800/- plus Grade Pay of Rs. 4200/4600/4800/5400/-. (Post 4-9,14), Rs. 5200 - 20,200/- plus Grade Pay of Rs. 2400/-. (Post 10-13) as per organisation norms. Application Has To Be Sent Latest By : 15-10-2018. Click Here For NCLT Official Notification Link. Central Jail Durg is ready to hire the applicants for the 04 available seats of Safai Karmachari (Sweeper) Jobs as per the Central Jail Durg Recruitment 2018 advertisement published on department web portal. Job seekers who have required eligibility may apply through Offline Mode after reading all the details of Central Jail Durg Recruitment 2018 through this section.You are needed to send the application form in the appropriate format at the below address till or before 31st October 2018. Education Needed : Candidates who are willing to apply for Central Jail Durg jobs must posses 5th from any recognised board. The candidates who wish to apply for the available vacancy should be existing between 18 - 30 years (for Others), 18 - 35 years (for CG State) as on 01-01-2018. Reserved category applicants will get the age relaxation as per Central Jail Durg norms. Emoluments given to Employee: Contenders who will be appointed successfully for Central Jail Durg Vacancy, they get the salary pay band of Rs. 15,600 - 49,400/- as per organisation norms. Deadline for Receiving Hard Copy of Application Form Is : 31-10-2018. Click Here For Central Jail Durg Official Notification Link. Central Jail Raipur is ready to hire the applicants for the 05 available seats of Sweeper Jobs as per the Central Jail Raipur Recruitment 2018 advertisement published on department web portal. Job seekers who have required eligibility may apply through Offline Mode after reading all the details of Central Jail Raipur Recruitment 2018 through this section.You are needed to send the application form in the appropriate format at the below address till or before 30th September 2018. Education Needed : Candidates who are willing to apply for Central Jail Raipur jobs must posses 5th from any recognised board. Reserved category applicants will get the age relaxation as per Central Jail Raipur norms. Emoluments given to Employee: Contenders who will be appointed successfully for Central Jail Raipur Vacancy, they get the salary pay band of Rs. 15,600 - 49,400/- as per organisation norms. The Last date For Acceptance of Application Forms : 30-09-2018. Click Here For Central Jail Raipur Official Notification Link. Cantonment Board Ambala is ready to hire the applicants for the 02 available seats of Sanitary Inspector, Assistant Electrician Jobs as per the Cantonment Board Ambala Recruitment 2018 advertisement published on department web portal. Job seekers who have required eligibility may apply through Online Mode after reading all the details of Cantonment Board Ambala Recruitment 2018 through this section.Candidates who meet the eligibility criteria and interested to apply they can submit their application form before the last date that is 28th October 2018. Education Needed : Candidates who are willing to apply for Cantonment Board Ambala jobs must posses 12th / Diploma (Sanitary Inspector) / ITI (Electrician) from any recognised board or institution. Those aspirants who are belonging to General/ OBC Category & interested to apply for above posts they need to be paid Processing fee of 500/-. Job hunters belonging to ExSM Category are exempted from such payment of processing fee. The candidates who wish to apply for the available vacancy should be existing between 18 - 25 years as on 28-10-2018. Reserved category applicants will get the age relaxation as per Cantonment Board Ambala norms. Emoluments given to Employee: Contenders who will be appointed successfully for Cantonment Board Ambala Vacancy, they get the salary pay band of Rs. 9300 - 34800/- plus Grade Pay of Rs. 3600/- (Post 1), Rs. 5200 - 20200/- plus Grade Pay of Rs. 2400/- (Post 2) as per organisation norms. Selection of the job hunters will be done on the basis of their performance in the Written Exam, Skill test conducted by the selection committee. Starting Date of Online Registration of Application Form Is : 29-09-2018. Last Date For Apply Online : 28-10-2018. Click Here For Cantonment Board Ambala Official Notification Link. Click Here For Cantonment Board Ambala Official Notification Link 2. Repco Bank is ready to hire the applicants for the 02 available seats of Officer on Special Duty Jobs as per the Repco Bank Recruitment 2018 advertisement published on department web portal. Job seekers who have required eligibility may apply through Offline Mode after reading all the details of Repco Bank Recruitment 2018 through this section.You are needed to send the application form in the appropriate format at the below address till or before 30th September 2018. 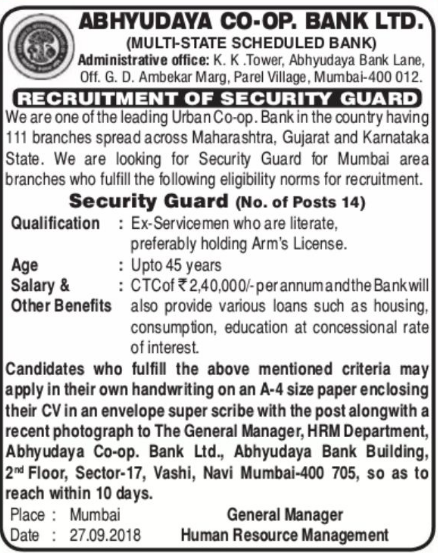 Education Needed : Candidates who are willing to apply for Repco Bank jobs must Have worked as officer in any scheduled commercial bank not below the rank of Scale III officer cadre with minimum 5 years of experience in inspection of Banks’ Branches/Vigilance Department. The candidates who wish to apply for the available vacancy should not be more than 62 years as on 31-08-2018. Reserved category applicants will get the age relaxation as per Repco Bank norms. Click Here For Repco Bank Official Notification Link. District Court Malkangiri is ready to hire the applicants for the 10 available seats of Stenographer, Junior Clerk Jobs as per the District Court Malkangiri Recruitment 2018 advertisement published on department web portal. Job seekers who have required eligibility may apply through Offline Mode after reading all the details of District Court Malkangiri Recruitment 2018 through this section.You are needed to send the application form in the appropriate format at the below address till or before 31st October 2018. Education Needed : Candidates who are willing to apply for District Court Malkangiri jobs must posses 12th / Diploma (Computer Application) from any recognised board or institution. Those aspirants who are belonging to General/ OBC Category & interested to apply for above posts they need to be paid Processing fee of 100/-. Job hunters belonging to SC/ ST Category are exempted from such payment of processing fee. The candidates who wish to apply for the available vacancy should be existing between 18 - 32 years as on 31-10-2018. Reserved category applicants will get the age relaxation as per District Court Malkangiri norms. Emoluments given to Employee: Contenders who will be appointed successfully for District Court Malkangiri Vacancy, they get the salary pay band of Rs. 25,500 - 81,100/- (Post 1), Rs. 19,900 - 63,200/- (Post 2) as per organisation norms. Selection of the job hunters will be done on the basis of their performance in the Written Exam, Practical & Skill Test, Viva Voce conducted by the selection committee. Closing Date for Forwarding Filled Application Forms : 31-10-2018. Click Here For District Court Malkangiri Official Notification Link. Malegaon Municipal Corporation is ready to hire the applicants for the 522 available seats of Veterinary Officer, Walmon, Watchman Jobs as per the MMC Recruitment 2018 advertisement published on department web portal. Job seekers who have required eligibility may apply after reading all the details of MMC Recruitment 2018 through this section.Candidates who have decided to build their career in this organisation they can attend Walkin Interview which are going to be held On 3rd October 2018 to 6th October 2018. Education Needed : Candidates who are willing to apply for MMC jobs must posses 7th / 10th / 12th / ITI / Diploma from any recognised board or institution. The candidates who wish to apply for the available vacancy should be existing between 18 to 38 Years. Reserved category applicants will get the age relaxation as per MMC norms. Date for the Walk In Interview : 03-10 to 06-10-2018. Click Here For MMC Official Notification Link. Office of Principal Commissioner of Customs is ready to hire the applicants for the 14 available seats of Launch Mechanic, Greaser, Seaman Jobs as per the Office of Principal Commissioner of Customs Recruitment 2018 advertisement published on department web portal. Job seekers who have required eligibility may apply through Offline Mode after reading all the details of Office of Principal Commissioner of Customs Recruitment 2018 through this section.You are needed to send the application form in the appropriate format at the below address till or before 12th October 2018. Education Needed : Candidates who are willing to apply for Office of Principal Commissioner of Customs jobs must posses 10th / ITI from any recognised board or institution. The candidates who wish to apply for the available vacancy should be existing between 18 to 30 Years (Post 1,4), 18 to 25 Years (Post 2,3). Reserved category applicants will get the age relaxation as per Office of Principal Commissioner of Customs norms. Emoluments given to Employee: Contenders who will be appointed successfully for Office of Principal Commissioner of Customs Vacancy, they get the salary pay band of Rs. 25,500 - 81,100/- (Post 1), Rs. 18,000 - 56,900/- (Post 2,3), Rs. 21,700 - 69,100/- (Post 4) as per organisation norms. Selection of the job hunters will be done on the basis of their performance in the Written Exam and Proficiency Test conducted by the selection committee. Click Here For Office of Principal Commissioner of Customs Official Notification Link. Surat Peoples Cooperative Bank Ltd is ready to hire the applicants for the 03 available seats of Assistant General Manager Jobs as per the SPCB Recruitment 2018 advertisement published on department web portal. Job seekers who have required eligibility may apply through Online Mode after reading all the details of SPCB Recruitment 2018 through this section.Candidates who meet the eligibility criteria and interested to apply they can submit their application form before the last date that is 5th October 2018. Education Needed : Candidates who are willing to apply for SPCB jobs must posses CAIIB / Post Graduation Degree / Double Graduate degree / Post Graduate Diploma from any recognised institution. The candidates who wish to apply for the available vacancy should not be more than 50 Years. Reserved category applicants will get the age relaxation as per SPCB norms. Emoluments given to Employee: Contenders who will be appointed successfully for SPCB Vacancy, they get the salary pay band of Rs. 94,000/- as per organisation norms. Selection of the job hunters will be done on the basis of their performance in the Written Exam, Personal Interview conducted by the selection committee. Online Registration of Application Form Ends On : 05-10-2018. Click Here For SPCB Official Notification Link. Sikkim High Court is ready to hire the applicants for the 09 available seats of Officer, Accounts Officer, Translatorcum-Typist Jobs as per the Sikkim High Court Recruitment 2018 advertisement published on department web portal. Job seekers who have required eligibility may apply through Offline Mode after reading all the details of Sikkim High Court Recruitment 2018 through this section.You are needed to send the application form in the appropriate format at the below address till or before 27th October 2018. Education Needed : Candidates who are willing to apply for Sikkim High Court jobs must posses 8th / licence in driving light vehicle / B.Com / L.L.B Degree / Bachelor Degree from any recognised board or institution. The candidates who wish to apply for the available vacancy should be existing between 18 to 30 Years As on 27-10-2018. Reserved category applicants will get the age relaxation as per Sikkim High Court norms. Emoluments given to Employee: Contenders who will be appointed successfully for Sikkim High Court Vacancy, they get the salary pay band of Rs. 15,600 - 39,100/- plus Grade Pay of Rs. 6200/-. (Post 1), Rs. 9300 - 34,800/- plus Grade Pay of Rs. 5000/-. (Post 2-5), Rs. 5200 - 20,200/- plus Grade Pay of Rs. 3400/-. (Post 6,7) as per organisation norms. Selection of the job hunters will be done on the basis of their performance in the Written Exam and Driving Test, viva Voce conducted by the selection committee. Last Date to Submit Filled-In Application : 27-10-2018. Click Here For Sikkim High Court Official Notification Link. National Institute for Research in Tuberculosis is ready to hire the applicants for the 07 available seats of Technician Jobs as per the NIRT Recruitment 2018 advertisement published on department web portal. Job seekers who have required eligibility may apply through Offline Mode after reading all the details of NIRT Recruitment 2018 through this section.You are needed to send the application form in the appropriate format at the below address till or before Within 45 Days. Education Needed : Candidates who are willing to apply for NIRT jobs must posses 12th / Diploma (Medical Radio Diagnostic Technology) / ITI (Diesel Mechanic / Motor Mechanic Vehicle) from any recognised board or institution. Those aspirants who are belonging to General/ OBC Category & interested to apply for above posts they need to be paid Processing fee of 300/-. Job hunters belonging to SC/ ST/ PwD/ ExSM/ Women Category are exempted from such payment of processing fee. The candidates who wish to apply for the available vacancy should not be more than 28 Years. Reserved category applicants will get the age relaxation as per NIRT norms. Emoluments given to Employee: Contenders who will be appointed successfully for NIRT Vacancy, they get the salary pay band of Rs. 19, 900 - 63,200/- as per organisation norms. Selection of the job hunters will be done on the basis of their performance in the Written Exam / Personal Interview conducted by the selection committee. Closing Date to Submit the Application Form : Within 45 Days. Click Here For NIRT Official Notification Link. Jharkhand High Court is ready to hire the applicants for the 73 available seats of Assistant, Cashier, Translator, Typist, Assistant Librarian Jobs as per the Jharkhand High Court Recruitment 2018 advertisement published on department web portal. Job seekers who have required eligibility may apply through Online Mode after reading all the details of Jharkhand High Court Recruitment 2018 through this section.Candidates who meet the eligibility criteria and interested to apply they can submit their application form before the last date that is 223rd October 2018. Education Needed : Candidates who are willing to apply for Jharkhand High Court jobs must posses Graduation Degree (Library Science / Commerce / Economics) from any recognised institution. Job hunters belonging to SC/ ST/ PWD (Persons with Disability) Category & interested to apply for above posts they need to be paid Processing fee of 125/-. The candidates who wish to apply for the available vacancy should be existing between 18 to 35 Years (for male), 18 to 38 Years (for female). Reserved category applicants will get the age relaxation as per Jharkhand High Court norms. Emoluments given to Employee: Contenders who will be appointed successfully for Jharkhand High Court Vacancy, they get the salary pay band of Rs. 44,900 - 1,42,400/- (Post 1,4), Rs. 35,400 - 1,12,400/- (Post 2,3,5), Rs. 25,500 - 81,100/- (Post 6) as per organisation norms. Selection of the job hunters will be done on the basis of their performance in the Written Exam and Typing Skill Test/ Viva-Voce/ Computer Skill Test conducted by the selection committee. Starting Date of Online Registration of Application Form Is : 08-10-2018. Closing Date of Online Submission of Applications Form Is : 23-10-2018. Click Here For Jharkhand High Court Official Notification Link. Delhi Judicial Academy is ready to hire the applicants for the 12 available seats of Field Investigators Jobs as per the DJA Recruitment 2018 advertisement published on department web portal. Job seekers who have required eligibility may apply after reading all the details of DJA Recruitment 2018 through this section.Candidates who have decided to build their career in this organization they can attend Walkin Interview which are going to be held On 4th October 2018. Education Needed : Candidates who are willing to apply for DJA jobs must posses Graduation Degree (Law) from any recognised institution. Emoluments given to Employee: Contenders who will be appointed successfully for DJA Vacancy, they get the salary pay band of Rs. 5000/- as per organisation norms. Click Here For DJA Official Notification Link.